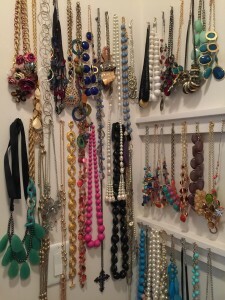 A collection of necklaces in plain sight make accessibility and coordination easier, while creating wall art of sorts. 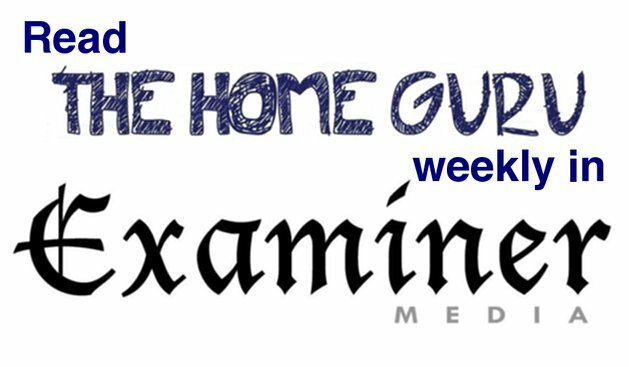 While I wear the mantle of The Home Guru, I get practically all of my ideas and advice from others who are specialists in their fields. But most times, the spark of an idea comes right at home, faced with a chore to be done or some small improvement to make life easier or more enjoyable. And frequently, they are suggested by my wife Margaret. 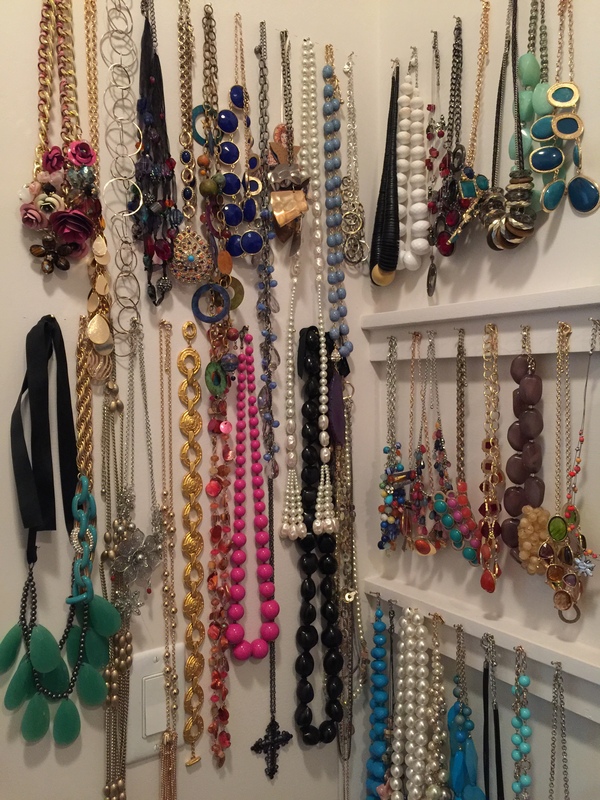 Just recently, she came up with a clever organization idea for her walk-in closet resulting from her frustration of having to fumble around in a jewelry chest for just the right necklace, among many she has collected, to match her outfit for the day. To the left of the entrance is a corner with two small stretches of bare wall where she suggested I nail several rows of brass brads from which she could hang her necklaces in plain sight. “See it to use it,” she said. I counted out her necklaces, noted their length, then nailed three rows of the brads in an attractive, even pattern. After my wife had hung the necklaces in their new open environment, we realized we had created a work of art of sorts. But the practical aspect of the project is its usefulness every time she holds up a garment and can see at a glance which ones coordinate. Since we created this little project, a couple of my wife’s girlfriends have been introduced to the idea and have promised to organize their necklaces in the same way. From this small project we are inspired to find even more ways to put frequently used objects in plain sight. For instance, I’ve taken to organizing all my home office suppliers in see-through containers, as well as old files, so that additional labelling is not required as with the cardboard boxes I formerly used. Not everyone will be a fan of keeping items out in the open. I supposed people fall into two camps: one side needs to see everything in its place to feel assured that their home is in order, while the other side wants to keep things out of sight so their environment may function as a blank slate. Some people may also worry that they will “stop seeing” items if they are always out in the open. Rather than inspiring more frequent use, their various collections may dissolve into so much background noise. My suggestion is to be judicious about what goes on display. Too much of anything, or too many items loose without an assigned home, will become clutter, and clutter is the enemy of organization. Pick out only what you really use, and use frequently, and take the time to give everything its own place. What may otherwise have become disheveled can instead look enticing. 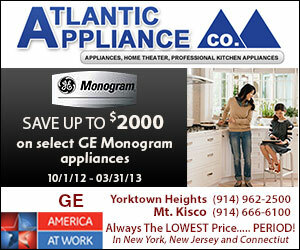 The kitchen is no doubt the busiest room for most families, and storing items in the open can help boost efficiency. Plates staked on edge in racks, pots and pans hanging from peg boards, and serving utensils arranged in vases have become popular, and a set of open shelves, opposed to closed-up cabinets, can make a kitchen appear larger. If you worry that dust will settle on plates, you can choose cabinets with glass doors. If you are prone to purchasing small appliances that you don’t use as often as you would like – I am thinking of slow cookers, pasta machines, stand mixers and the like – having them lined up on a dedicated shelf, out of the way but not out of reach, may make inspiration strike more frequently when you are planning which dish to make. Food itself can suffer from being out of sight and, therefore, out of mind. Think about which foods are easiest to see and reach, and you may get a sense of what foods you are eating most. Follow the nutritionists’ advice instead, and keep fresh fruit in bowls on the counter and sliced crudité on an eye level shelf in the refrigerator. Move leftovers to transparent containers, or at least label them, and you are more likely to eat them before they go bad. Our hobbies give us much pleasure, so why not indulge in the display of your tools and materials even when you are not using them? You might find wall space to display woodworking tools, multicolored skeins of yarn, or exercise accessories. Seeing your favorite tools and materials may spark a creative impulse in you, even at an odd hour. If out of sight is out of mind, everything in plain view is more likely to be used and therefore be truly useful.